Everyone loves a good architectural image and designs unveiled last week for a new concert hall for London got predictable blanket coverage. The Centre for Music, replacing the current Museum of London building at London Wall, would be a state-of-the-art 2,000 seat “in the round” venue and home for the London Symphony Orchestra, whose new musical director, classical superstar Sir Simon Rattle, has been a key advocate of the project. 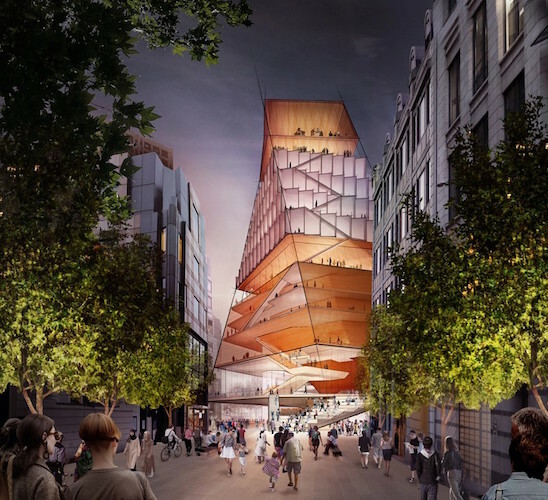 The design by US architects Diller Scofidio + Renfro shows a tapering tower including four floors of commercial space as well as rehearsal and education areas and a base for the Guildhall School of Music, topped by a smaller performance space with views across St Paul’s and beyond. New public space would open up access to the Barbican complex, while the forbidding roundabout currently surrounding the museum will be remodelled and the road routed under the new building. London certainly lacks a world-class concert hall. Its existing venues, the Albert Hall, the Royal Festival Hall and the Barbican itself are second-best in terms of capacity and acoustics. The centre, says Barbican managing director Sir Nicholas Kenyon, could “enhance the status of London as one of the world’s leading cultural capitals, delivering major new benefits to the city and the UK’s musical life, educational offer and international reputation”. But will the £288 million scheme ever get built? The project looked doomed in 2016 when Chancellor Philip Hammond reversed his predecessor George Osborne’s pledge of £5.5 million towards a detailed business plan, arguing the scheme was unaffordable. Rescue came in the shape of the City of London Corporation, providing initial funding and earmarking the museum site for the project as part of its “Culture Mile” plans, linking the Barbican to Tate Modern via St Paul’s and revamping the area from Farringdon to Moorgate as a “world-leading cultural and creative destination”. The museum is moving down the road to the disused Victorian general market building adjoining Smithfield meat market, with architects Stanton Williams and Asif Khan appointed and much of its estimated £250 million funding in place, including £110 million from the City Corporation and £70 million from Sadiq Khan. By contrast, the cost of the Centre for Music will be met by private backers, its sponsors say. “It is my sincere hope that it will attract generous support from businesses in the Square Mile and beyond. That is vital to its success,” said City Corporation policy chair Catherine McGuinness. Commentators cite cost overruns on similar projects: the Paris Philharmonie three times over budget and Hamburg’s concert hall where the price rose from £157 million to almost £700 million. Also, the Garden Bridge debacle has dented appetites for public underwriting. While Mayor Khan has welcomed the plans as potentially strengthening London’s “reputation as a global leader for culture” as well as giving “people of all backgrounds across the capital the opportunity to enjoy first class music, including young and budding musicians,” his Culture Strategy cautiously offers advocacy only.